When you do a little research, you’ll notice that raw pumpkin seeds are actually very healthy. When you dig a little further, you’re also going to notice that zoos often add pumpkins to their primate enclosure simply because it’s a cheap and they’re actually amazing enrichment devices. Simply cut a hole in the pumpkin and your monkey(s) will keep themselves busy for many hours. Let’s talk a little bit about the great benefits of pumpkin seeds. While pumpkin seeds are high in calories, they’re packed with fiber. vitamins, minerals, and numerous health promoting antioxidants. According to animal studies, it is suggested that pumpkin seeds may help improve insulin regulation and help prevent diabetic complications. Since they’re rich in healthy fats, antioxidants and fibers, pumpkin seeds may provide benefits for heart and liver health especially when mixed with flax seeds. Pumpkin seeds are known to be a great source of protein, iron, zinc, manganese, magnesium, phosphorus, copper, and potassium. Convinced? 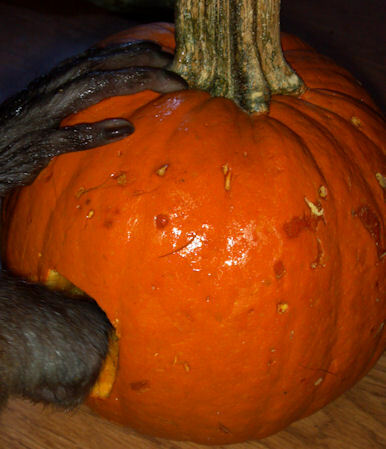 Hurry up to the store and get yourself a pumpkin for your monkey!